Sri Lanka Association for Software and Services Companies (SLASSCOM) in collaboration with partner organisations the Asian Development Bank, Ministry of Education, Information Communication Technology Agency of Sri Lanka and the Export Development Board organised the Galle IT-BPM Week 2018 recently. This three-day event was all about educating and building regional capacity to support the future growth of the industry. This is the third of the SLASSCOM IT Week series, with prior events conducted in Jaffna and Kandy. The theme for this year was ‘Inspiring a New Generation of Creative Global Leaders’. The program kicked off with the Educators Workshop which focused on sharing knowledge and experience on the latest trends in technology and innovation. Over 200 school principals and ICT teachers from schools in the Galle district participated at this event. The workshop addressed industry trends, career opportunities and importance of creative education programs being introduced to the education system. The hands-on session on Design Thinking was well received by the participants. Its goal was to show teachers how they could encourage their students to think creatively and build innovative products. During the workshop, the teachers learnt the importance of empathy, ideation, prototyping and testing in coming up with real-world innovations. This was followed by a student awareness program, at Mahinda College which reached over 2,500 young minds and exposed them to the opportunities available in the industry. These sessions focused on school children from Grades 7-9, and discussed the benefits of choosing a career in the IT/BPM industry. The session highlighted the high earning potential, overseas exposure, flexible work environments and open culture available within the IT/BPM industry. 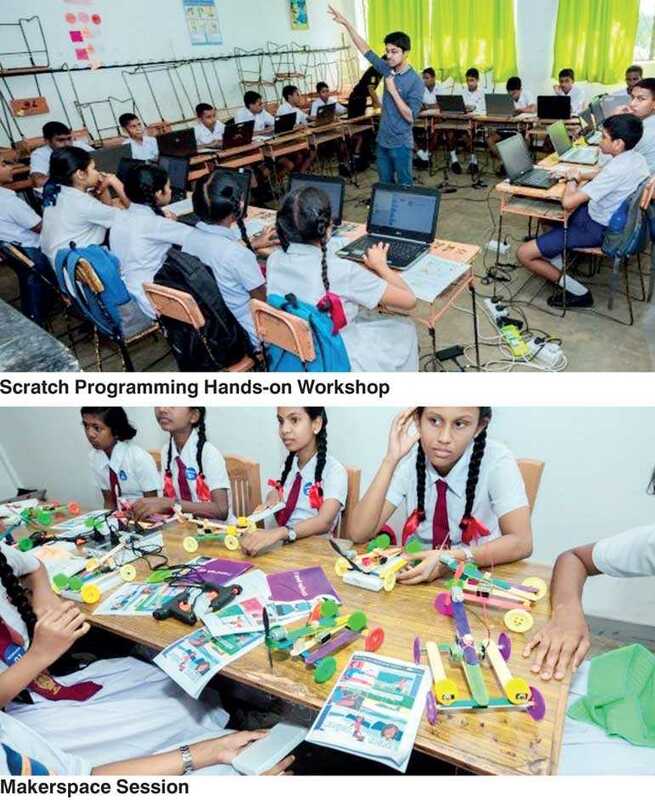 The final day was a series of ‘hands-on’ sessions for over 500 students on the essentials of Robotics using micro:bit devices, Scratch programming and Innovation workshops. These were conducted in multiple small groups to provide the required support and attention to students. In parallel to this event, there were also multiple sessions conducted on ‘Tech for Girls’ and increasing parents’ awareness and exposure to the IT/BPM industry. The final day of the event also hosted an exhibition which featured inventions of around 50 young innovators to inspire the visiting students and parents. SLASSCOM appreciates the support from the Asian Development Bank (ADB), Information and Communication Technology Agency of Sri Lanka (ICTA), the Ministry of Education (MoE) and the Export Development Board (EDB). Educational and industry support has been provided by Platinum Partners – Microsoft and IFS, Education Partner – Informatics Institute of Technology (IIT), Design Partner – Tryonics, Corporate Sponsors – Dialog and Hatch, Coverage Sponsor – SLIIT, Digital Media Partner – ReadMe, Educational Media Partner – LearnTV, Media Partner – Derana. Other industry sponsors include Sysco Labs, 99X Technology, WSO2, Fortude, Zone 24X7, Pearson, London Stock Exchange Group (LSEG), CodeGen, IgniterSpace and RR Donnelley.